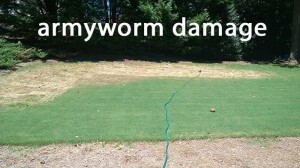 Fall armyworms (FAW) are eating their way across lawns as we speak. We're getting calls about them in our Outlets, so if you live in the Southeast (even as far north as north Georgia and North Carolina) and love your lawn, please scout for them daily. Increased bird activity is a sure sign of FAW presence in your lawn. FAW LOVE NEW SOD above everything else, but they will eat established sod too. 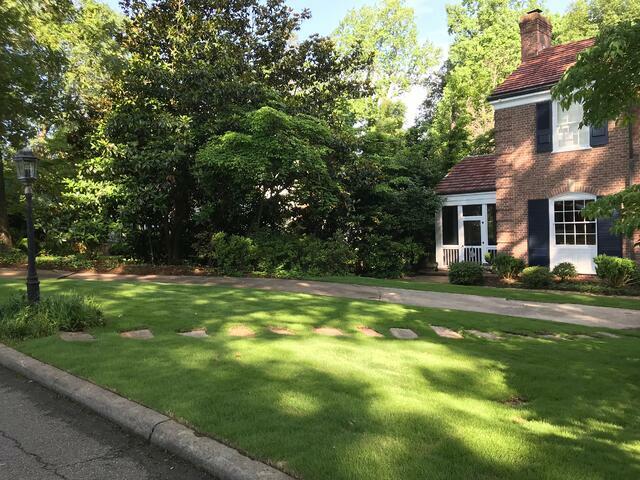 Their culinary propensity for new sod makes it appear that these creatures arrived WITH new sod, but lawn care experts and extension specialists are familiar with this problem and know that FAW are already on site before new sod is laid. New sod is like a fresh buffet spread out before them. 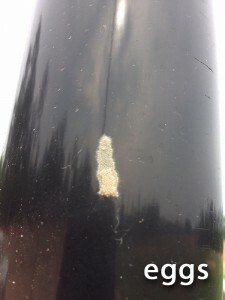 The eggs are laid in shrubs adjacent to turf or in unexpectedly non-horticultural places like sides of building, fences, posts, signs, old cars, and I've even seen a picture of their egg masses on a flag. Unlikely, seemingly inhospitable places as seen in the picture of a black post. We rarely see them in our production fields because with hundreds of acres of tightly mowed turf there is nowhere suitable for them to lay their eggs. When eggs hatch, out comes the larvae that goes hog wild on your lawn. The "larvae" are really the "worms" which are really "caterpillars." 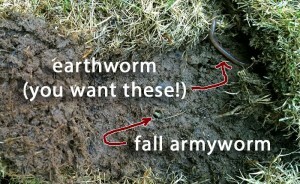 So, we find out that they are not really worms at all, it's just some catchy name. The caterpillars are the damaging phase. Notice how you don't see them everywhere at once on your lawn. They march across from one side of the lawn to another and this shows that they hatch from eggs that were deposited adjacent to the lawn. 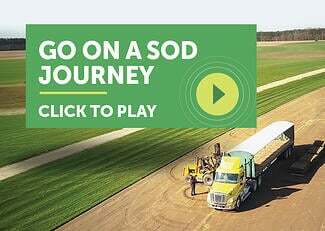 If the FAW came with the sod, they would certainly be everywhere at once eating sod, wouldn't they. 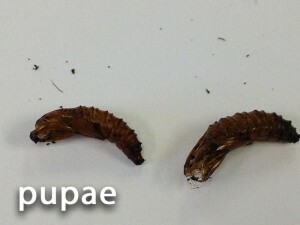 The larvae somehow (I've forgotten my entomology lessons here) become the pupae, which are non-damaging, but they are hideous, cockroach-colored, torpedo-shaped awful things that bury themselves into the soil so we don't have to see them, thankfully. The pupae "pupate" into moths, which are considered the adults, and it's the moths/adults that have the babies. The moths lay a new round of eggs and the cycle repeats itself. 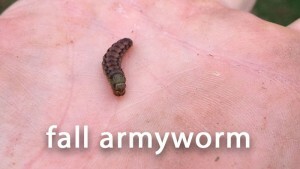 Sooooo, if you've had fall armyworms once, look for them twice. We hate it too.  We're written a lot more about FAW in our July Lawn Tips email, but there are two points I'm going to pull from there, just in case you won't follow my link and read all the interesting facts we have there. #1. There is no "over the counter" preventative treatment available to homeowners for FAW in the egg, pupa, or moth stages. However, insecticide is available to homeowners for treating when they're in the larva/caterpillar stage, which is when they are doing their damage. #2. 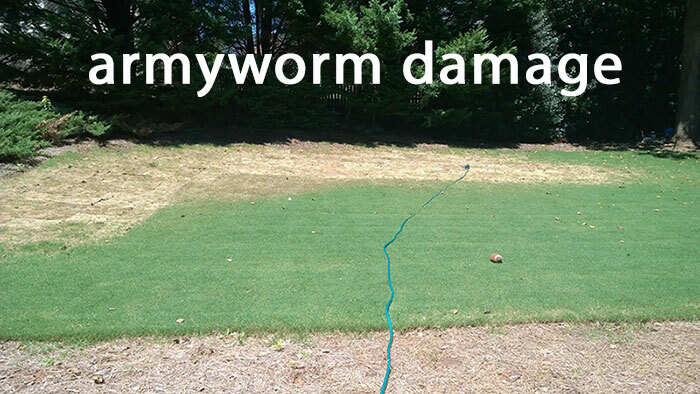 When you see a sign of them, treat your lawn immediately because they can do terrible damage within 24 hours. Treatment time should be late in the evening or early in the morning; both times are when they are most active. Liquid insecticides are best and we recommend two treatments: one in the evening and one the next morning. It's always sad when a customer calls about FAW. 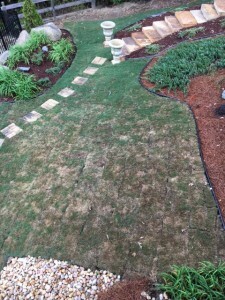 Here's a picture of a beautiful lawn that was attached by FAW three weeks after being installed. The new sod is the brown section; the green section was laid two month earlier. The FAW troops attacked the new sod first, from the perimeter, moving inwards. Most of our Outlets carry FAW insecticide, but if one of them doesn't, they can still make a recommendation, so give them a call. In the case of the customer's lawn above, Scott at our Gwinnett Outlet tells me, "We spoke on the phone at about 4:20pm one afternoon, so I told him to run to Home Depot and use the Triazicide. It made more sense to get them treated immediately than to wait until we opened the next day." 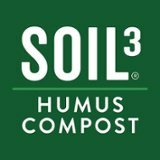 Our customers should be on alert for FAW activity until the first frost. After you've applied your insecticide treatments, we recommend applying starter fertilizer (5-10-30) to your lawn the next day. Continue to water your lawn each morning for several days. The good news is that, in most cases, a warm season type of lawn will recover. FAW don't eat stolons and rhizomes of warm season turf and growth will resume from those resilient plant parts. While warm season grasses, given proper care, will typically recover from FAW damage, damage to tall fescue is often much more significant. Fescue simply does not have the same tolerance to FAW activity, particularly if it is not very well established. As a result, FAW damage in tall fescue often requires overseeding or re-sodding in order to repair the damage. A new lawn can go from fine one day, to a complete loss in a little as 24 to 48 hours. Tall fescue users cannot take the FAW threat too lightly.